Woody Allen has probably made more films than John Ford, D.W. Griffith and Terrence Malick put together. Twilight Time recently released a meticulously transferred edition of his Husbands and Wives (1992), and has now quickly followed with Manhattan ɹǝpɹnW Mystery, which I believe was his 168th production, and second in 1993.
it typical of their work, which means perfection. A film about relationships, therapy, murder(? ), and apartment dwelling in Manhattan, it occasionally takes reaches in Rear Window ethics for suspense, but it all work nicely, and it’s a wonderful way to spend 107 minutes. Strangely, I seemed to recall this film being in black & white. It was beautifully shot in color by Carlo De Palma, who previously shot Blow-Up, and would shortly thereafter provide services to Mighty Aphrodite. Since Mr. Allen keeps his troupe together, he also shot Hannah and Her Sisters, Radio Days, September, Alice, Shadows and Fog, as well as the aforementioned Husbands and Wives, Bullets Over Broadway, and Deconstructing Harry. Terrific film, and another gorgeous Blu-ray from Twilight Time. Woody Allen has so many films under his belt because he began directing films during the silent era. Unfortunately, all are lost to time. However, one of his early expressionist talkies fortunately does survive: Shadows and Fog. UFA and shot in a widescreen process used only for this film, approximately 1.85. It seems Dr. Goebbels didn't like the widescreen format. Great film and highly entertaining. I've been on a Woody kick lately thanks to the TT MGM sale and while those films are quite good, the presentations from MGM are typically a shade below what is normally provided by Mr. Crisp's team. How can I type words backwords and upside down? Thats the best part of this review! 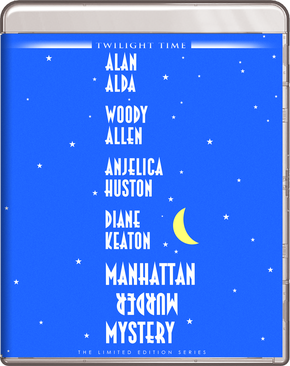 I haven't gotten around to buying Twilight Time's release of Manhattan Murder Mystery, and I only have it on a homemade DVD-R duped from an HBO broadcast of long ago. Last night, however, TCM showed the HD transfer of the film, and I recorded it and watched it this afternoon. I always liked the movie, but I must admit I hadn't watched it in quite some time, so today's viewing was a revelation, not only for the superb quality of the HD transfer they used but also because the movie didn't end the way I remembered it. There WAS a murder! (I must be confusing it with some other movie – I don't remember which one – in which the protagonists spend the movie thinking there is a murder underfoot only to proven wrong.) And Anjelica Huston is part of the cast! Something else I didn't remember about it! Enjoying her so much will force me to rewatch Crimes and Misdemeanors later tonight. Thank you Robert Harris and Matt Hough. I wanted to buy The Barefoot Contess in the current Twilight Time sale but didn't want to buy it alone and couldn't decide on a second film to pick. I too have a homemade DVD duped from a Hollywood Suite broadcast (a Canadian 4-channel movie package) of Manhattan Murder Mystery and an upgrade sounds appropriate based on your comments. And to heck with the fact my wife doesn't like Woody Allen. I did go ahead and buy TT's Manhattan Murder Mystery, and I also did as I said I would and watched the brilliant Crimes and Misdemeanors on Blu-ray tonight. No need to discuss the movie or its quality; I reviewed the TT release when it first came out. A) Sold-Out: Long before I had ever expected it. B) Third-Market Amazon: $74.00 – $148.00 Used and New. That's a crime in itself! Or you can get it from the UK for about $17. As long as you have a region-free player. The UK release is Region B locked. True. Although for the $148 it costs from third party sellers, you could probably pick up the UK disc and a region-free player to go with it. I honestly don't know why everyone isn't region free. It costs little money and is so easy to use. I know the "New York" skyline/aerial photography/big band opening is a tired movie cliche by now, but the opening of MMM with Bobby Short's recording of Cole Porter's "I Happen to Like New York" against shots of NYC at night feels fresh and new and it never fails to put me "in the mood" for a cozy little upper east side murder mystery. I love the song "I Happen to Like New York." I couldn't help but wish a little bit that Woody had used Judy Garland's rendition (it's a very robust rendition), but I guess Bobby Short was synonymous with New York/Manhattan. I really like Liza’s version from her Carnegie Hall concert. It’s totally wrong for the opening of MMM, but a great rendition in general. "You don't have to see your shrink, there's nothing wrong with you that can't be cured with a little Prozac and a polo mallet."